There’s a familiar pattern that shows up when someone criticizes or attacks me. First, I feel it in my body – my throat closes, my muscles tense and the pit of my stomach starts to churn. Usually it’s accompanied with the heat of shame creeping up my neck and into my cheeks. Then my mind starts to race to try to make sense of the messages it’s receiving, usually leaping to the conclusion that I must be a bad person and I need to do something to defend myself or change myself to appease the person who’s doing the criticizing. Often, this is followed with a seemingly endless repetitive churning as my mind becomes fixated on the situation and my body stays in high anxiety mode. I work through the conversation, attack, or criticism again and again, trying to devise the right response that will make the anxious feeling go away. Courage is not the absence of fear, but the resolve to act in spite of it. What’s important to know about that very human reaction to criticism or attack (or any negative information about yourself) is that it’s rooted in the most ancient part of your brain that is looking out for your best interests. The amygdala is responsible for those instinctual reactions that keep you safe – fight, flight, freeze, and tend and befriend. Without it, you probably wouldn’t live past your second birthday because you’d walk into traffic, play with bears, or do any number of other things that you’re meant to be afraid of. The problem is that, in a trauma situation, the amygdala gets hijacked and doesn’t allow your thinking brain (the orbitofrontal cortex) to take over and speak reason into the situation. You’re stuck in high alert because the amygdala keeps sending danger signals to the body that can’t easily be overwritten with reasonable thoughts. At this point, you may be thinking “but how can criticism trigger the amygdala when there is no real danger?” Well, the amygdala is not the smartest part of your brain and it doesn’t know real danger from fake danger and so it sends the same signals regardless of the truth. It all goes back to your childhood. In early life, your primary needs are for safety and belonging. Whenever those things are jeopardized, you become anxious because your immature brain believes that you will cease to exist without those needs being met. Anything that jeopardizes your safety and belonging is a threat that the amygdala is designed to respond to. Somewhere along the line, likely through an emotional trauma, you (and I) internalized the message that a criticism was a threat to your safety and belonging, and your amygdala learned to respond accordingly. Normally, as you grow up, you should be able to adjust accordingly and learn to use your orbitofrontal cortex to reason with the amygdala about the validity of risk, but a trauma tends to get stuck in your body in such a way that the thinking brain takes longer to engage. And if you never work to heal and shift that trauma and calm the nervous system when you get triggered, you’ll stay in that stuck place and forever be reactive in an unhealthy way. Let’s throw some attachment theory into the mix as well. Attachment theory teaches us that the ability for an individual to form an emotional and physical “attachment” to another person gives a sense of stability and security necessary to take risks, branch out, and grow and develop as an independent and confident person. That’s the belonging piece that I mentioned as one of our basic needs. With a secure attachment it’s much easier to develop the kind of self esteem and confidence that supports a person in withstanding criticism and attack. Without a secure attachment, a child grows up with a deep sense of insecurity that makes it difficult for healthy emotional development to happen. A secure attachment is one that allows for both safety AND autonomy. In a secure attachment, a child knows that the parent (or other primary attachment figure) is a safe haven to return to when they are threatened, which makes that child more able to explore and wander away from the parent, building their confidence in themselves as they do so. A secure attachment is flexible to the needs of a child, offering more safety in the early stages and allowing more autonomy as the confidence grows. Secure attachment continues to be a critical part of emotional development even in adulthood. When you are triggered by a criticism or attack, especially if you have an attachment wound from childhood or you lack a secure attachment in adulthood, your anxiety is immediately heightened and your confidence and resilience are shaken. You find yourself floundering, needing to re-attach and find an anchor that will help you weather the storm. In your moment of floundering, you can’t think clearly, and so you may see the person offering the criticism or attack as the person with whom you need to repair the attachment so that you’ll feel safe again. As a result, your mind races to all of the things you need to do to appease the person and/or get them to change their opinion of you. Sometimes I wonder, in fact, whether every person I meet carries some trauma and/or attachment wound in their body. It seems, at times, to be the very soil we grow in (at least in the part of the world that I’m most familiar with). We have been traumatized by oppressive systems (ie. colonialism, racism, patriarchy) and, on top of that, we have been raised by parents who likely didn’t have any idea how to talk about or heal the trauma they’d inherited and so didn’t know how to create secure attachment bases from which we could grow. As a result, we have a culture of people who are overly reactive to criticism and attacks, and in their own triggered reactions, lash out at other people to protect themselves. It’s a self-perpetuating problem and it appears to me to be systemic. Unless we can learn to receive and process negative information, however, our personal development is stunted as is our society’s capacity to evolve. We’ll continue to react defensively whenever difficult conversations need to happen and we’ll reject the important information that helps us evolve. What then should we do to get better at processing the negative information? Recognize that trauma is in your body and can’t simply be released by the brain. While talk therapy might be helpful for processing some of your trauma and attachment wounds, it’s also important to seek out some body work (ie. Reiki, cranio-sacral, EMDR, massages, Body Talk, yoga, TRE, etc.). Find what works for you and repeat when necessary. Aside from hiring professionals, I’ve also found that things like Epson salt baths and long walks can help with the release. Develop secure attachments and turn to those attachments for support when you’re feeling anxious or threatened. Much of the literature about adult attachment roots these secure attachments in romantic relationships, but they can also be found in friendships, sibling relationships, or in therapeutic relationships. I have a couple of very good friends and a sister, for example, who help to ground me when I’ve been attacked and need a secure base. Wired for Love is a good resource (though I wish there were a version not about romantic relationships). Explore healing for the trauma and attachment wounds that come from childhood and/or that you have inherited. Seek out the teachers and professionals that are doing work that resonates with you. I have found some healing, for example, in family constellations and I know there are many other methodologies and practitioners that are doing good work. Know that you have a right to healthy boundaries. Not all criticisms and attacks need your attention – in some cases you simply need to recognize your right to guard yourself against them. On social media, recently, for example, I’ve been letting people know that I’m open to reasonable conversation even if they disagree with me, but if they show up for no other purpose than to attack or argue, I will block them. Even if the person attacking is a family member or close friend, you have a right to guard yourself from attack. Regularly engage in activities that make you feel strong and grounded. Recently, I built some storage shelves and a folding work table in my garage, and when I finished I felt empowered and self-confident because it was hard work AND I accomplished what I didn’t think I was capable of. The next time I was criticized (the very next day) I more easily let it roll off my back and established a new boundary because I was feeling resilient. Woodworking does that for me. You might find it in gardening, rock-climbing, hiking, swimming, kick-boxing, yoga, dance, etc. In my experience, it’s those activities that engage my body and stretch my capacities that are most effective. Recognize when the criticism or attack is pointing to something that is systemic and needs to be viewed that way instead of being received as a personal attack. If, for example, the person is talking about white or male privilege, colonialism, etc., and you feel personally attacked, pause for a moment and reflect on whether the injustice they’re pointing to is embedded in the system you inherited and that you benefit from and isn’t just about you personally. If it is, then do what you need to do to soothe your nervous system, then engage from a more conscious perspective, taking responsibility for how you can contribute to a more just system. Tell your stories. As Brené Brown has taught us, the best defence against the kind of shame that often cripples us is to be vulnerable with people who know how to hold space for us. Find a sharing circle, or a few close friends who offer you a non-judgemental space to admit those times when you were triggered and reacted in a way that you regret. Saying it out loud can help it have less power in your life and can increase your resilience for future situations. Note: Special thanks to my friends Sheila and Saleha – recent conversations with them helped inspire this post. P.S. 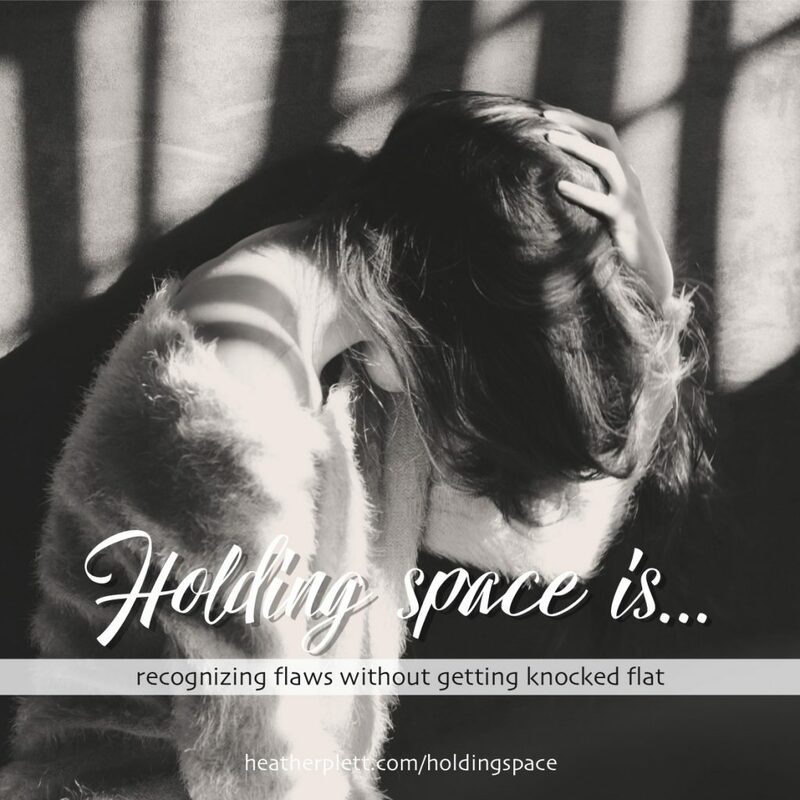 Want to learn more about how to hold space for yourself so that you’re more resilient and confident in how you hold space for others? It’s part of my Holding Space Coach/Facilitator offering and the next session starts in January. If you want to be notified when registration opens, send us a note and Krista will put you on the list.